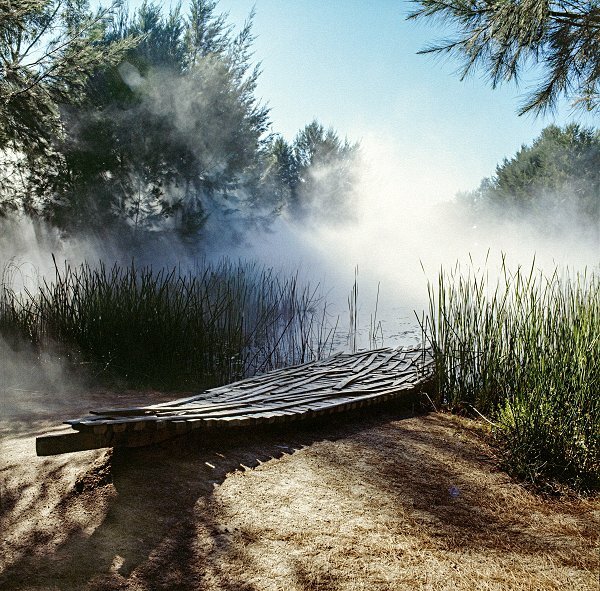 The NGA’s fog sculpture by Fujiko Nakaya is a beloved part of the sculpture gardens. Photos: NGA. In some ways, the name says it all: if you are wandering through the National Gallery sculpture gardens at lunchtime, you’ll slowly become aware that tendrils of mist are curling through the casuarina trees. The air visibly softens and it’s as though you’re walking into a cloud forest. 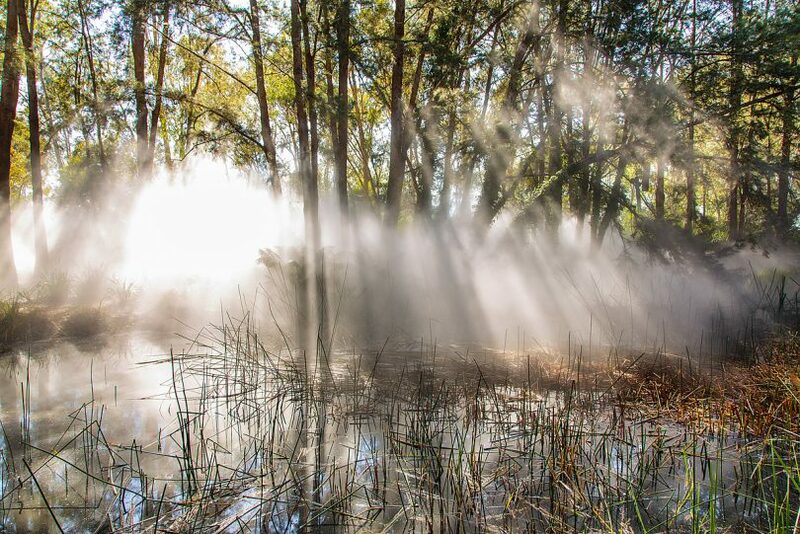 You’ve discovered Fujiko Nakaya’s sculpture Foggy Wake in a Desert. And now for the very first time, the Japanese artist who created the work will be seeing it in place. The National Gallery’s legendary first director, James Mollison, brought the piece from an installation in the Domain during the 1976 Sydney Biennale, but it was packed away while the gardens were being built. Now a collaboration between the Gallery and local sculpture biennale Contour 556 is reuniting the artist, now in her 80’s, with the much-loved work for a discussion and performance. Nakaya is still very active as an artist and travels widely: Hobbs had seen a magical work at architect Philip Johnson’s Glasshouse in Connecticut, the totally transparent modernist house which Nakaya temporarily obscured with a rising tide of fog. Robert Stackhouse’s On the Beach Again joins the fog sculpture installation. Hobbs says that the NGA had tried to bring Nakaya out several times but it didn’t work out for them or Contour 556’s festival. But this time the stars aligned and she will be at the NGA on Saturday, March 9 for three afternoon events. Nakaya will be joined by Australian Japanese new media artist and musician Ben Skepper, whose grandmother was a Japanese war bride. Skepper, who is a classically trained composer, has been making a recording of Nakaya’s heartbeat. That forms the basis for a soundscape using field recordings from around the world to create a musical experience where place and sound shifts and blends like the fog through casuarina needles. The afternoon will begin with Nakaya talking about her work in the local context and also more broadly: the NGA installation was the first example of her work in a permanent collection, in what would become a longrunning and distinguished career. Skepper’s subsequent performance forms part of his own larger body of work at the intersection of art and science (he has an ongoing fellowship at the Moscow State Conservatory and Russian Academy of Science looking at the human body and music). Fujiko Nakaya is excited too, telling Hobbs that seeing her piece in place after more than 40 years will be “like seeing a daughter again”. And given the event happens during Enlighten, Hobbs suggests that in a very Canberra way you could immerse yourself in fog and high art and then slope off for some noodles at the night markets afterwards.